Motherwell striker Danny Johnson has told the Motherwell Times he was mystified by the controversial decision to chop off his ‘goal’ at Easter Road on Sunday. Referee Bobby Madden inexplicably disallowed the ex-Gateshead forward’s 85th- minute shot, and the Scottish Premiership season opener ended in a 3-0 defeat for the Steelmen. “I don’t know what the referee’s given it for, to be honest,” said Johnson (25). “A few people have watched it back and said my arm’s down by my side and it’s hit around my shoulder area. “And the ref’s given it, so it’s very disappointing for me really. “I was about to run, get the ball out of the net and run back to the halfway line. 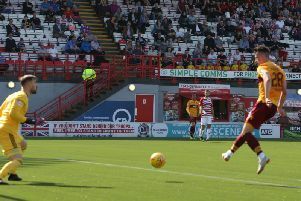 Johnson made a significant impact after coming on as a 62nd-minute substitute for Curtis Main in Edinburgh. The Middlesbrough-born ace was unlucky with a shot off the inside of the post, had the rebound blocked, and was also through on Adam Bogdan twice – but the Hibs keeper blocked both efforts. Johnson added: “It’s disappointing to start the first game of the season with a defeat. “We expected better really but, on a personal note, I’ve come on and I could have had four or five, couldn’t I? Johnson has spent a lot of time on the substitutes’ bench in the very early part of this campaign – with Main and Conor Sammon the preferred starting partnership – but he may well be pushing for a start in this Saturday’s home Scottish Premiership derby against Hamilton Accies. said: “I’ve had to be patient the last few weeks but I think every time I’ve come on I’ve given the manager something to worry about. “And doing everything right to get in his mind to start a game. “Sammon and Main have got the reputation, they’ve got the experience, they’ve played at higher levels than me. “But I’m very confident that, when I’m given my chance, I’m at that level and I’m ready to go. “We need to bounce back against Hamilton and get that win, especially against our local rivals. Having played at National League level down south for the bulk of his career, Johnson is already relishing life playing for a club in Scotland’s top flight, a much more high profile level than he’s used to. The former Middlesbrough youth player added: “As soon as I walked off the bus and into the ground I was like: ‘Oh, here we are’. “I’m not used to grounds like this. “Obviously it’s a much bigger crowd than I’ve ever played in front of before. “The previous biggest was about 9000 – Tranmere v Luton – so it’s a shock to the system but I think I handled it very well. The significant impact made by Johnson against Hibs was acknowledged by Well manager Stephen Robinson in his post match comments. Robbo said: “I thought Danny was excellent. “He has waited for his opportunity. “And I thought he was really bright when he came on. The Motherwell manager also praised fellow sub Gael Bigirimana and emphasised the importance of this week signing a replacement for departed centre back Cedric Kipre. “We thought Bigi was probably going to leave the club,” he said. “He wanted to get himself back down south. “But that hasn’t happened so we brought him back into the fold. “He’s come on with the bit between his teeth and showed a lot of bravery on the ball. “I have to add, yes. I only have two fit defenders at the football club. “And I say fit. Peter Hartley’s still getting back and we’re throwing him in and I thought he did well.